Customers have always liked the convenience of browsing and buying products from the comfort of their home – on their laptop or mobile phone – and e-retail stores fulfilled this dream of theirs several years ago! Soon enough, the eCommerce space was filled with multiple online stores selling everything – from clothing and footwear to gadgets and books. But this also meant increased competition with eCommerce trying multiple digital channels – sometimes at the same time – to grow and maintain their target customer base. The most frequently used marketing tactic these days is push notifications, and that includes both mobile and browser. A 2014 survey of 1,200 adults by global marketing cloud service agency Responsys states that push notifications deliver 50% higher open rates than emails and are used as a default feature to communicate with users on a daily basis. It’s a fact that desktop still accounts for 42% of the total internet time, and there’s nothing better than using web push notifications to deliver personalized, real-time messages to this group of users. It is the mail lever for the marketers to pull in order to make their customers’ shopping experience more personalized, accessible and helpful! This marketing feature is a smart tactic to capitalize on the opportunities that mobile has created in the last few years. If the users visit the website, it means they are clearly interested in the products up for grabs. But since they have left the products in the cart and probably forgotten about them, it’s best to remind them. The fastest way to reach those people is via mobile phone. Similarly, if they have opted to be notified of similar deals or offers while they are browsing through the website the first time, then browser push notifications can work their magic! These notifications could be used to create a sense of urgency with messaging like the product is out of stock, a new ‘buy 1, get 1 free’ offer, etc. to make them come back and complete the purchase process at the earliest. Frankly speaking, no one has the time to visit an eCommerce website every day and check the ongoing deals. Yes – email newsletters are a powerful tactic to inform the customers but they don’t initiate a quick response. Push notifications, on both desktop and mobile, can notify them of price drops instantly! So if the brand is having a massive sale or is running a limited-period offer, such notifications can literally give them the “push” required to turn their attention to the services you are providing. Such a notification is sent to users in a certain geographical area to deliver a message that is relevant in terms of both time and place. For instance, in the image given below, the three brands sent messages to users stating the actual distance from the store in a bid to attract them. Not only this, the messages also contain loyalty points or a coupon code or a discount deal to instantly catch the eye of users. This works best if you take food orders online or run a similar business, because then it becomes your responsibility to make sure your customers know where their delivery is! GrubHub.com provides free online food ordering service and informs its customers in the wittiest fashion ever! Basically, GrubHub provides value by monitoring the delivery time of the order placed by its customers. The image is an example of the app providing an excellent post-sales experience. What do you think? Such a notification prompts the user to complete his first search started on mobile app and thereafter, encourages using the search function. TripAdvisor, a travel website and mobile app, makes complete use of such a transactional push notification. In the image given below, it encourages the user to finish a search he or she began on the TripAdvisor mobile app, by providing a heads up, such as possible increase in prices of the apartments. Personalized notifications lead to at least 25% in clickthroughs as compared to generic notifications – and Wigzo not only believes in this but also has made sure that the assistance provided is super personalized for maximum conversions. 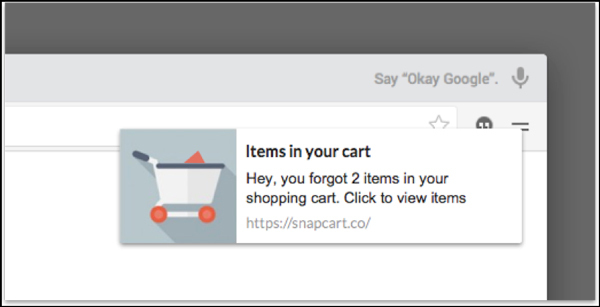 Using Wigzo personalised, segmented & trigger-based notifications, you will be able to convert 33% of people abandoning their carts, and also retain 26% more users using segmentation & behavioural notifications. It’s all about making shopping convenient and fun for the modern customer. Shopping is an expression of needs, wants and desires, and if a business is able to tap into that without being too robotic in its messages, the job is done and it has secured a loyal customer!